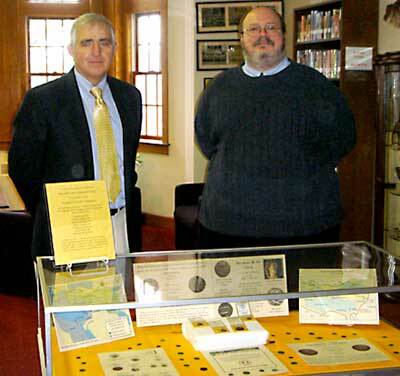 In December, the Trinity Pawling School received four very special coins through the generosity of the Ancient Coin Collectors' Guild (ACCG) in recognition of the school's participation in the Ancient Coins for Education (ACE) program. The four coins were a bronze coin of Alexander the Great (ruled 336 - 323 BCE), a serrated bronze Seleukid Kingdom coin of King Alexander II Zebina (ruled 128 - 123 BCE), a silver Denarius of Roman Emperor Septimius Severus ( ruled 193 - 211 CE), and large bronze coin of Byzantine Emperor Maurice Tiberius ( ruled 582-602 CE). These four were donated to the school by the ACCG in addition to 25 early 4th century Roman bronze coins. All are currently on display in the school's library. On hand for the presentation by Scott Uhrick, a resident of Danbury, who is a Director of ACE and a member of ACCG, were Trinity Pawling's Assistant Headmaster, David Coratti, the Dean of Faculty, Maria Reade, both residents of the Pawling school; Latin teacher, Anne Pearson of Brewster, and the seven members of TP's Latin III class: senior "Bryce", junior Philipp of Gottingen, Germany, and sophomores John, Ethan, Nick, Brian and Anthony. The Latin III class is the first group at Trinity Pawling to participate in ACE. The aim of ACE is to stimulate interest in the ancient world by "putting history in the hands of students". 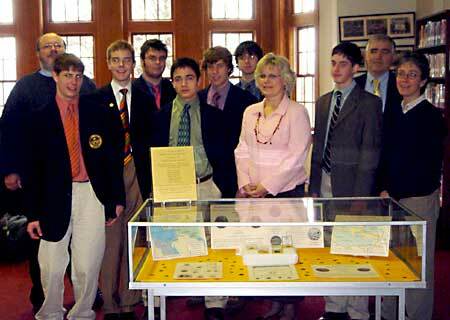 For a nominal fee (costs are sometimes subsidized by coin collecting groups), schools are given a CD with a wealth of information about coins in general as well as teaching materials (all of which are also accessible on-line), a special contact who acts as a Mentor and enough coins - mostly dating from around the early 4th century CE -- for each participating student to have his or her own to study. After learning about the history of coins and coin-making, students are led through steps enabling them to identify the emperor and any special circumstances there might be under which their coins were minted. At the end of the program, the coins belong to the students. Ace Director Scott Uhrick presents John B. with the Budding Numismatist Award as Assistant Headmaster Dave Coratti looks on. In addition, throughout the year, ACE runs contests of various types in which students can win other coins. 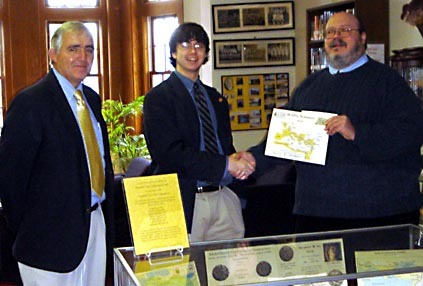 Trinity Pawling's John B. was awarded the Fall 06 Budding Numismatist Award and Emperor Valens bronze coin early in the year for his interest and enthusiasm in the program, and both he and Bryce G. won prizes in the Fall Mythology Contest: in first place, John won a bronze coin of Augustus, the first Roman Emperor, and as runner-up, Bryce won a Crispus, son of Constantine the Great, bronze coin. The four special coins donated by ACCG will be kept by the school and will hopefully be only the beginning of a larger collection. The additional 25 Optimates will be used to expand the program to additional classes at Trinity-Pawling. More information about the ACE program can be found at www.ancientcoinsforeducation.org.